Surface Go puts the power of Windows 10 in your palms. It essentially offers the same experience as the significantly pricier Surface Pro, with a few cuts to keep its price tag low. But for a lot of tablet buyers, those cuts won’t matter. The most affordable Surface Go, priced at $399, offers 64GB of storage and 4GB of RAM — but there is a $549 model that gives you 128GB of storage and 8GB of RAM. Both are powered by Intel Pentium Gold 4415Y processors with HD Graphics 615. Both also offer nine hours of battery life, 10-inch PixelSense displays with 1800×1200 resolutions at 217 pixels-per-inch, and all the features you would expect from a Surface device, including Pen and Type Cover support. They also have USB-C ports, headphone jacks, microSD card readers, the propriety Surface Connect port, and even Windows Hello facial recognition. What makes the Surface Go better than the iPad — for many tablet users — is that it’s powered by Windows 10. You get a full, desktop operating system that runs all your favorite apps and games. You can also connect mice and other PC accessories. The device ships in S mode, which is the lightweight Windows 10 option that only lets you download apps from the Microsoft Store. But there is a one-way upgrade to full Windows 10 available for those who need it. Other features include an 8-megapixel rear-facing camera, 2W stereo speakers with Dolby Audio Premium, and a built-in microphone. 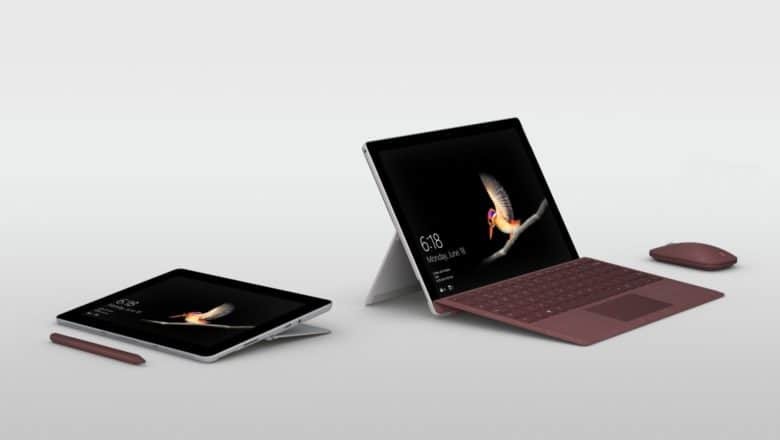 You can order the Surface Go today from the Microsoft Store, or from Amazon.com.